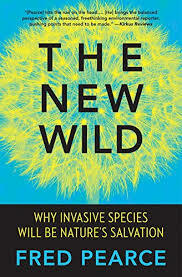 The New Wild by Fred Pearce is a must-read book that challenges our thinking about nature and how to view the environment and the plants and animals who we share the Earth with. Of course, this is impossible for us to do. We can not help ourselves. And to make sense of it all, we have to break things down into smaller pieces because it is too much effort, and the cost is too great, to take the holistic worldview and start from there. So, a myriad of small-thinking decisions are made with the inevitable consequences, thereby bringing us to the second part (“Myths and Demons”). “The results are often comical,” Pearce notes as he examines “misplaced notions about how aliens affect the real world and how we do conservation.” (p. xv). Here, as in the books about cats I have also been reading recently, islands and the struggle between “native” and “non-native” species becomes the platform through which the world is put to right. Except that life is not that simple. What happens in the Galapagos can not be projected out to the North American continent. Pearce is an accomplished writer who marshals much information that is presented clearly except for a few times when I felt the weight of the evidence becoming too much. But this is more than made up for by his pithy remarks and wry observations. As an animal rights advocate, I am currently working in the area of outdoor living domestic cats. They are, according to some, responsible for mental disease in people, extinction of birds, environmental pollution, and often sentenced to death as a non-native invasive species. But from reading The New Wild, my understanding of the arbitrary and caprciousness of labelling life as “native” and “invasive” is deeply problematic. For starters, it stems from the prejudicial thinking of some life forms as the “other.” Now that we live in the age of the anthropocene, and climate change and mass extinction are facts of life, we need to understand nature as a dynamic, ever-changing force. It is not a romantic, pristine past that with some jiggery pokery we can recreate like a Disney theme park. We are all made up from things that were, at some point, native and non-native.